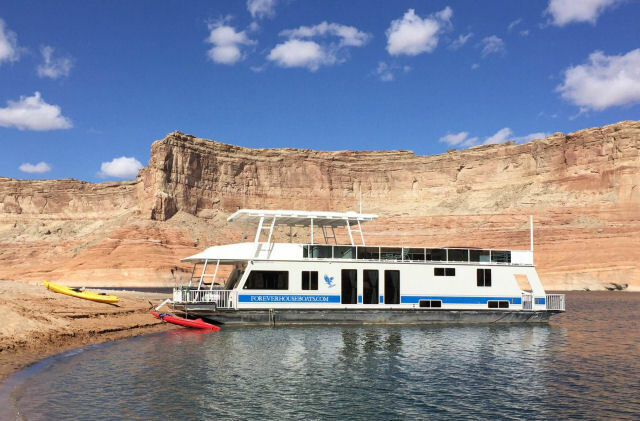 Millennium Magazine was thrilled to be the guest of Forever Resorts located on beautiful Lake Powell in Arizona within the Navajo Nation and explore it in style.The magnificent man-made lake was created after the construction of the Glen Canyon Dam, which began in 1956 and took a decade to complete. It was named after Major John Powell, one of the most highly accomplished yet little known American explorers. We traveled the lake and stayed aboard a 70 foot houseboat that was furnished as luxuriously as a fine hotel. 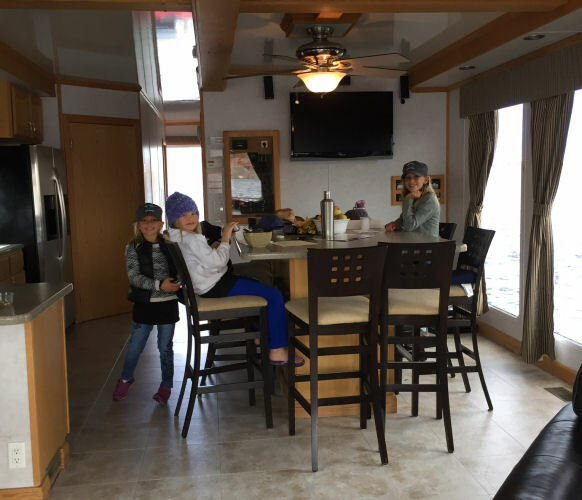 Upon our arrival we boarded our 4 bedroom boat, each one complete with crisp clean linens, ample closet space, a small TV and DVD player. The huge kitchen/dining area is equipped to prepare meals for a family reunion, party, corporate getaway or vacation. For a little added luxury, Forever Resorts provides a service that purchases your groceries and puts them away on your boat before you arrive, leaving your clothing as the only thing to remember. Rustic style leather living room furniture and accents gave the houseboat a warm and comfortable western feel that makes one feel at home in the wild west. On the top deck the full size of the boat a hot tub and wet bar, awaits you for unique comfortable outdoor travel around the lake. For children, the boat has a full size slide, complete with a water spout to keep the slide fast and slippery; delivering them right into the lake. If captaining a boat is not your forte, one can be provided to take you around the lake to explore and find a beach of your choice to anchor off of and to bring you back to the marina at the end of your stay. Because Houseboats are big and move slowly, Forever Resorts offers additional water crafts that include ski boats, deck boats, party pontoons, personal watercraft or jet skis most people know them as and kayaks all for rent throughout the year, summer being the most popular season but also the most crowded season. Spring season was our choice because it is uncrowded therefore serene and magical. We chose to bring along Kayaks and a small ski boat to explore the crystal clear green waters as the sun was shining and the lake was as still as a sheet of glass; a spectacular sight! Everywhere we went the lake was framed by beautiful towering rock formations and enormous red cliffs which surround the area for as far as the eye can see. It is said that there is nothing like it anywhere on the planet. 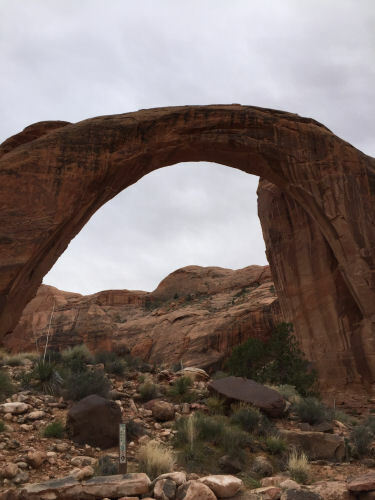 Our trip to the Rainbow Bridge in Lake Powell is the planet’s tallest natural bridge. This rainbow-shaped arch is 290 feet tall, spans 275 feet and is 42 feet thick at the top. For centuries the natural bridge has been regarded as sacred by the Navajo Natives who consider personified rainbows as the guardians of the universe. 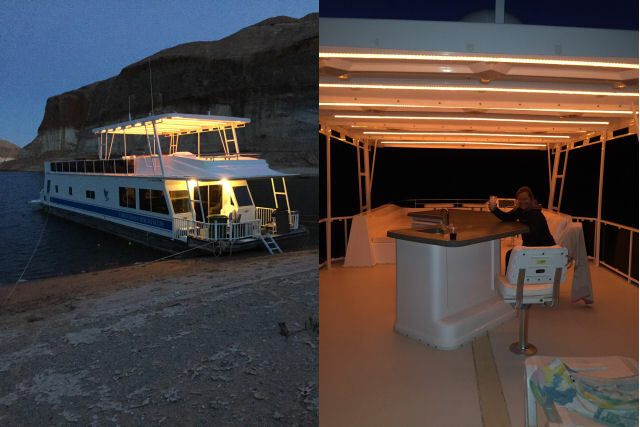 Nestled among the canyon walls, the Bridge is accessible via a 2-hour boat ride from Antelope Point Marina or about a 14-mile trek by foot or horseback across Navajo Reservation Land. Our cruise to the Rainbow Bridge was a not to be missed adventure as we traveled the narrow throughways amongst some of the most beautiful rock formations you could ever imagine. With a small paper map and some signs in the water we felt like a mouse in a maze of rock and could sense the ancient times throughout our body and soul as we traveled the cryptic land of waterways. 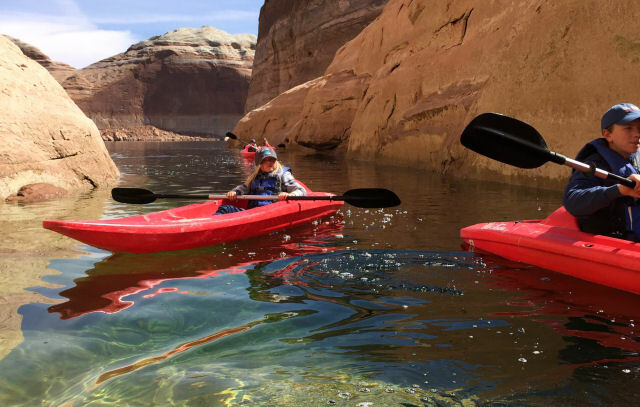 Each year millions of visitors come to Lake Powell and it was easy to understand why. Not only are you surrounded by unsurpassed beauty but depending on how far you travel away from the marina, there are areas where you are out of cell phone range and can almost experience what it was like back in the settler’s days. However for safety sake the boat has a radio in case of an emergency. Besides boating, there are numerous water activities, such as water skiing, scuba diving and sailing if planned right and are experienced as the canyon walls make this tricky, para sailing with permit only as this is dangerous here, lake surfing, wake boarding and fishing. 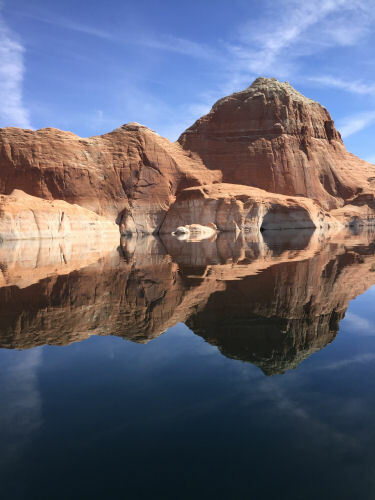 On land you can hike, horseback ride and visit the Glen Canyon Dam or famous Antelope Slot Canyons (which you will need an easily attained permit for, as they are on the beautiful Navajo Land and in which they use the fees help the Navajo Nation) and much more. A fleet of beautiful luxury houseboats ranging in size from fifty to seventy five feet and smaller watercraft from twenty four to forty four feet for daytime exploration are all for hire to fulfill your dream vacation and with a wonderful staff that takes care of your every need in a kind and professional manner — who could ask for anything more?